The microprocessor is often both the most delicate and the most expensive part of a homebuilt computer. As such, it deserves and requires special care. Handle processors gingerly, and never touch the pins or conductors with your fingers. Don't drop them and don't set them down on anything other than the packing pad they came with or an anti-static pad. Processors are extremely sensitive to static charges and physical shock. A static charge that's too small for a human being to even feel can completely destroy a processor. In addition, processors can be damaged by rough handling or being dropped. Never handle a processor roughly, never touch the pins, and never handle it unless you are using proper anti static precautions. Note that the wrist in the picture has an anti-static wrist band wrapped around it. Handle the processor carefully, holding it only by the edges. Set it down only on an anti-static mat or on the foam pad that it was shipped in. Be kind to your processor, and your processor will be kind to you. Processor sockets are keyed to prevent improper installation. In theory, it should be impossible to install them incorrectly. But because they're so delicate and the pins are so fine, it's really, really easy to permanently damage a processor that has pins if you're not very careful. 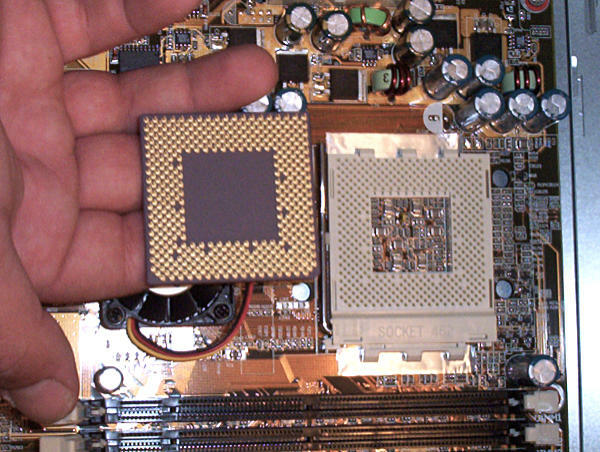 Notice in this picture that both the processor and the socket have two corners without pins. This is to prevent the processor from being installed the wrong way. All processors have some system to prevent improper insertion, but they're not all the same. Sometimes you have to look at the pins, and sometimes you have to line up an arrow. Whatever the case, look carefully before you insert the processor to make sure that you're inserting it correctly. If your processor came with a manual, read it to make sure you understand how to install it. Fortunately, modern processors and sockets have a ZIF (Zero Insertion Force) design and most don't even have pins. If the processor is aligned properly with the socket, gravity alone should cause it to drop right into the socket. You should never need to use force greater than a gentle nudge with a single finger to insert a modern processor. Never, never, never. 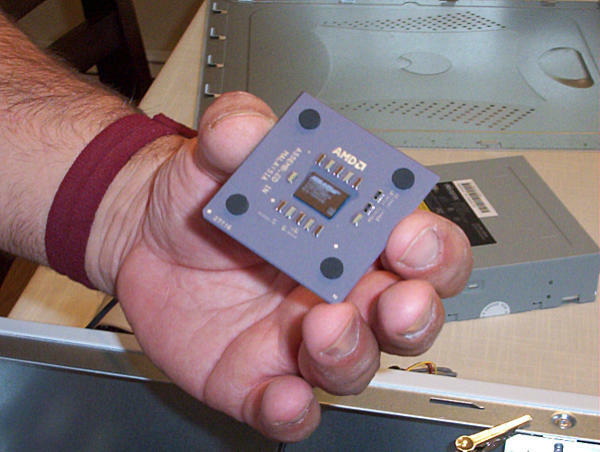 Processors without pins have little bumps that make contact with the CPU socket. They look like pimples and dimples. This design makes it nearly impossible to break the chip while installing it, but it does sometimes cause problems if dust, hair, or other debris finds its way to the socket. Canned air solves that problem. Many processors are secured by one or more bails mounted alongside the socket. Others have a frame on a hinge that folds over the processor to hold it in place. Most are spring loaded and snap into place, but others have to be screwed down. The design depends on the manufacturer who built the mobo. Whichever way your motherboard secures the processor, once you've lined up the processor (and the pins, if any) and allowed the processor to drop into the socket, check to make sure that the processor is fully inserted and not sitting crookedly. Once you're sure that the processor is in place properly, gently close the bail or the frame to secure the processor. 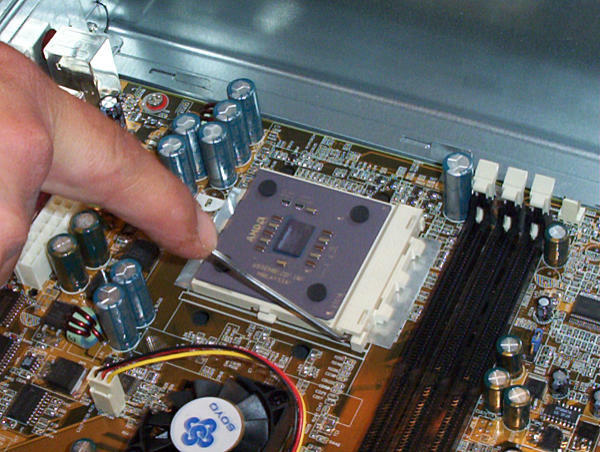 Be careful not to damage any capacitors or other components near the processor socket. It's easy to do if you're not cautious. If you encounter too much resistance, stop and check again to make sure that the processor is lined up correctly. If you try to secure the processor while it is not seated properly, you probably will ruin both the motherboard and the processor. Finished? Congratulations! Now take a breather and a swig of your favorite beverage and prepare for the next step: Installing the CPU Cooler.